OK, we’re live! Thank you all for stopping by and checking out the preview last time, and please spread the word on this project! We’re looking forward to getting the dragons made, especially, but all 4 designs are fun additions to the Tinker line of goodies. Yes, it’s been a while. Yes, I have a lot of things I could and would like to write about. For now, though, I’m short on time. I wanted to show this design, though, for the Dragon Tinker Metal Meeple that I’d like to get made in a Kickstarter project later this year. The “Dame”, “Fairy” and Top Hat” designs included for scale (the Top Hat gentleman is pretty standard meeple size, at 20mm tall or so, meaning this Dragon would be about 30mm tall, or 1 and 1/6″). The Dragon has a normal mechanized Dragon side, and an “aged” side, to give it a bit of gravitas. This also allows me to hint that it would be made of different metals, given that some parts don’t show the aging. 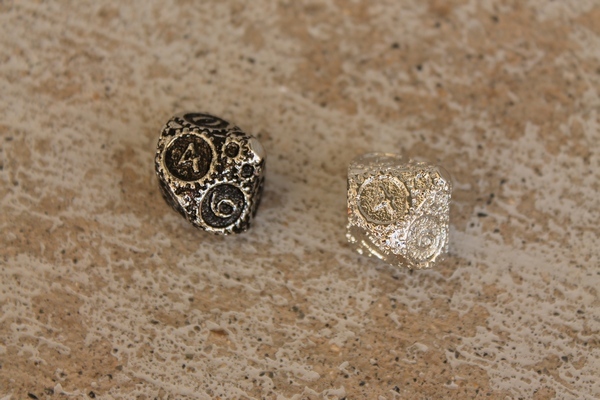 Now, I really would like to get the Tinker Steampunk-flavored Carcassonne tile variant designs done. They will take a bit more time, of course, and since I can’t really sell them, they will be a back burner “labor of love” sort of thing. Then there’s the Pantheon Wars game, the Fudging Fates dice and this other game I’m designing, tentatively calling it Shattervale… there’s a lot to do. Has it really been six months since I posted last? Sorry about that, it’s been somewhat crazy around here. We’re funded already, thanks to some fantastic early adopters, so at this point, we’re just looking for as many people as we can to get these spread far and wide. I would love to see these little guys all over the place, popping up in different games and locations, always making people happy to have them. No, things like this aren’t necessities, but there’s just something fun about little bits of treasure like this. If you’re interested, please check out the campaign, and maybe tell a few others about it. The more the merrier! 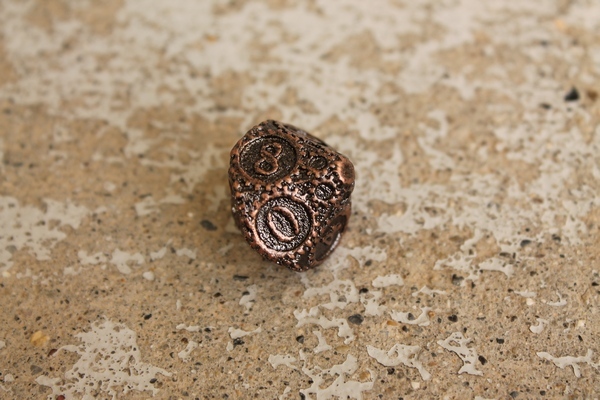 If you’ve perused the photo library of the Gearpunk dice, you might have noted that the Zinc-finished dice are rather shiny, especially when compared to the brass and copper variants. 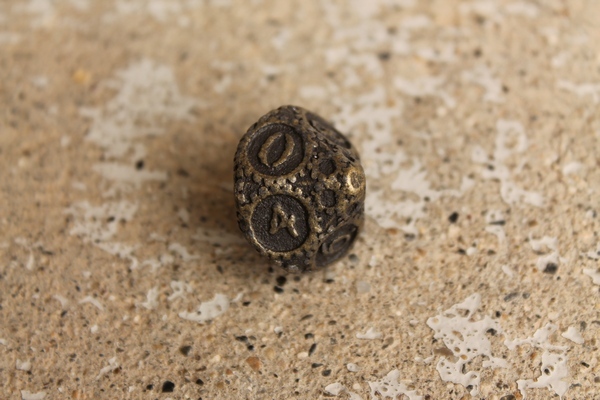 I’m partial to the antiqued look, both because I like the more rustic aesthetic, and because the antiquing makes the dice easier to read. 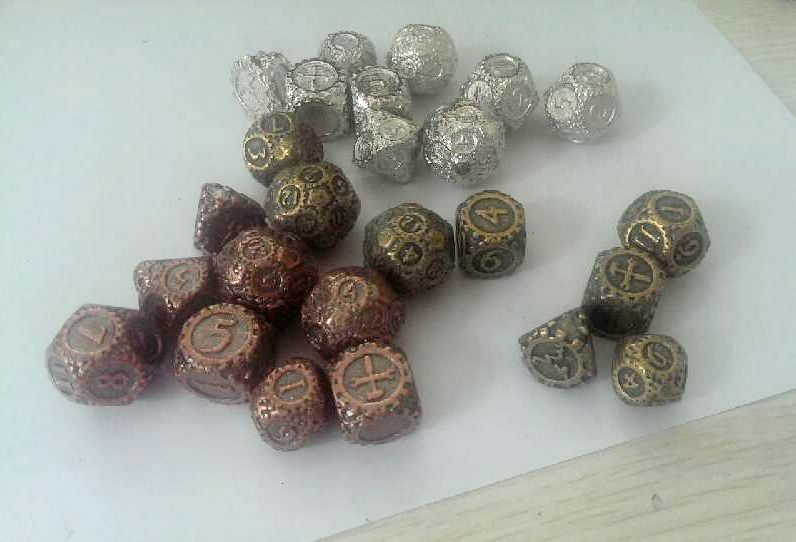 Since the factory managed to mangle our order’s quantities, we wound up with over 100 extra shiny Zinc D10 “decader” dice. One of them seemed like the perfect test subject, then, to see what sort of simple inking options I might have. I’ll be trying other experiments, but this is the initial test, which I’m pleased with. I used Speedball “super black” India ink, water and a small hobby paintbrush. Though I picked up mine in a set of three at the local hobby store for $2. It doesn’t need to be an expensive brush, just one that will hold a point when wet and is about 1/8″ in diameter or so. I put eight drops of water and three drops of ink in a plastic cup for this experiment. I diluted the ink to give myself a little time for the ink to dry. When used straight, the ink dries fairly quickly, and I wanted a little wiggle room in case I messed up. This experiment really doesn’t need a lot of ink, either. I would have been fine with 1 drop of ink and 2 drops of water in retrospect, though it’s not a bad thing to have a bit more than necessary… and it’s not like a few drops really put much of a dent in my supply. That’s the nice thing about this ink; it’s great to use, even when diluted. I used the brush to pick up a bit of the ink, then gently applied it to the background behind the numbers on the die face. The water tension naturally makes the ink settle into the recesses, though I did need to guide it around a little. I added a little with a light touch to the other recesses in the design, and brushed lightly to help spread things around and get some ink in the smaller details around the edges and corners. Since the ink does run a bit, I did only one face at a time, the one facing up and its edges. Inking the adjacent faces would mean the ink would pool largely on the downhill side of the contours, and while I didn’t want a flat color, neither did I want it heavily lopsided. Each face, then, took a few minutes to dry. That’s not too bad, and if I were doing a set of dice, one face at a time per die, by the time I finished with the last die’s upright face, the first die could be ready to roll over and do the next face. It’s best if you get each application dry before doing the next, so that timing might not work perfectly, but all in all, it wasn’t too much of a wait. I’m sorry I didn’t have my camera handy to take photos while I was working, this project had to fit in some of my very constrained time last night and I wasn’t properly prepared. 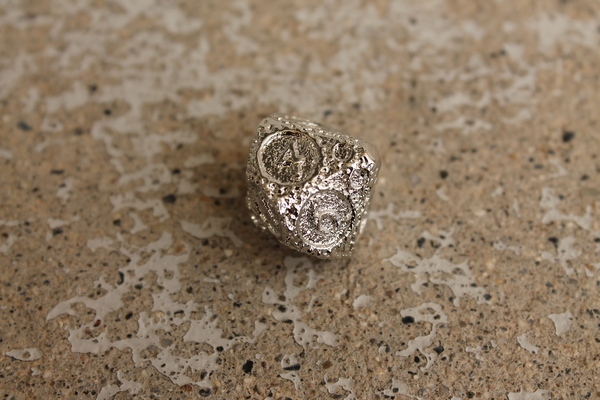 Here are some photos of the finished die next to one of its unprocessed kin, in a variety of lighting situations (including one that’s just a color correction, taking the yellows out of an indoor photo). I think it turned out well, much better than I had expected. I’ll be doing more experiments when I can, but this was a good start, I think. 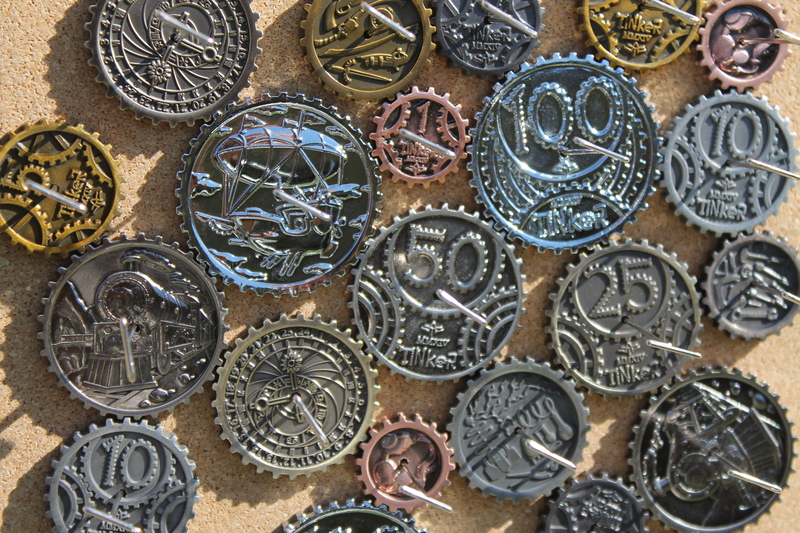 There are just over 24 hours left on my latest Kickstarter project, the Tinker Gearcoins. We started with 3 coins on offer and 7 moulds ready to go for stretch goals… and we’re up to 15 coins and a lapel pin (to make one of them a miniature astrolabe). I might try to make another one purely as an Add On. So… things have gone well. Thank you all for your help, and if you’ve a moment, please spread the word! 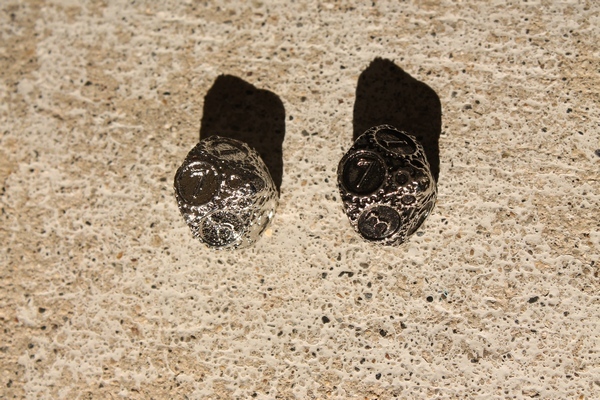 Oh, and we have the Havok & Hijinks coins up for sale over on our storefront. We made these as a part of a crossover with Ferrel‘s card game Kickstarter. It’s a sweet little game, and the coins work well as dragon treasure. We’ll have more stuff up on the store eventually. Since I’m officially unemployed and jobs are scarce, I’m trying to scrape things together to try to make my own products work. Tinker Gearcoins… Now With More Mad Science! The Tinker Gearcoin project funded, thank you everyone! …which will be a “driver” coin. That smaller gear’s round center will be a big hole, right through the coin, so you can put a pencil or finger in it as a handle to crank the coin around. Or it can be a pendant, earring or something else. It’s weird, it’s wacky, and I really don’t know where it will wind up. So if you have a moment and are interested, please check out the campaign over here, spread the word, and join us for the crazy ride ahead! Yes, I still have things I’d like to write about games, game design, art and photography… but I’m neck deep in the whole “finding a job” thing. I promise, we’re not going dark here at the blog, we’re just really busy. In the meantime, though, I have a new Kickstarter campaign fired up! There are some other photos kicking around on Pinterest over here, if you want to see some more details of the prototype coins. I’m really looking forward to getting these little gems made and sent out to people. 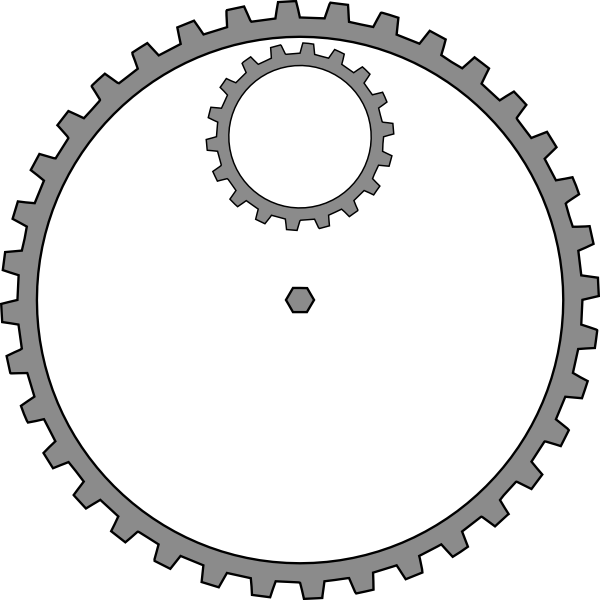 They have a lot of tinkering potential, I think, being coins that can actually function as gears. 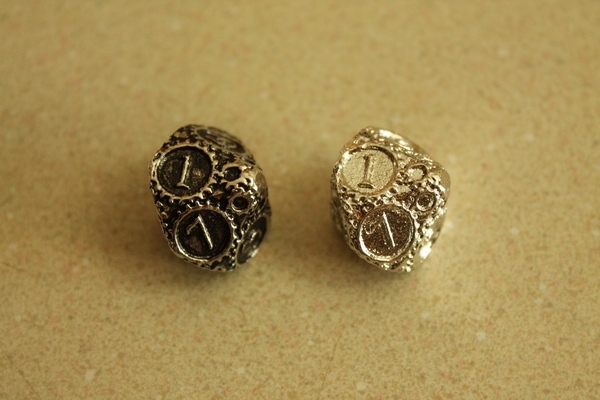 The Gearchips were toothed well, but these Gearcoins have a hole in the middle for a pin, so they can be pinned to something and spin freely. It’s going to be fun, seeing what people come up with. Thanks, everyone! Please spread the word if you have a moment. This one, like the Tinker Dice campaign, will definitely benefit from stretch goals, so the more the merrier! 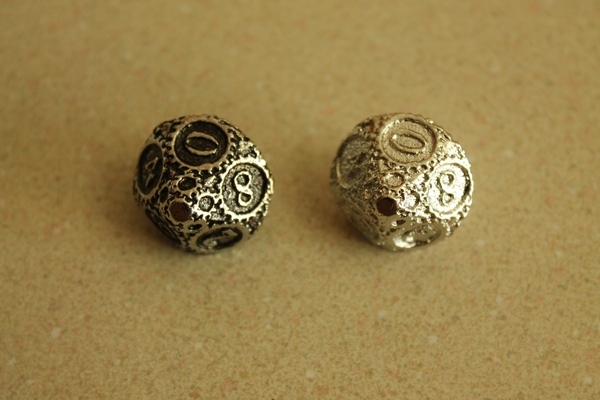 Oh, and we got some word that the Gearpunk Dice should be done soon. 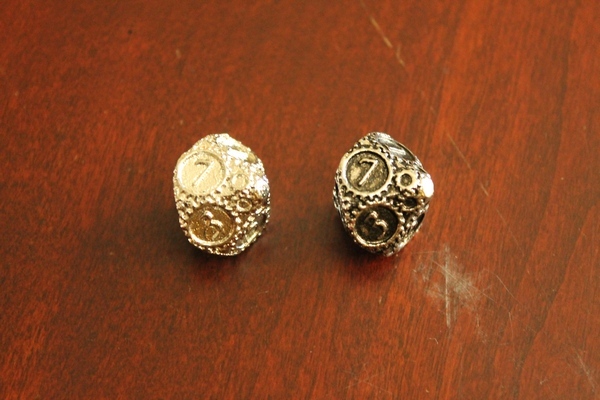 We’re getting the latest prototypes in the mail Monday, and I’m hoping we can approve them for full production. They sent us a photo to tide us over, but I’ll post some beauty shots as soon as I can. Next time, I’m going to try to finish up a bit of a rant about Marvel Puzzle Quest… again.